Most advertising agencies, branding firms, design firms and other professional specialties contain many interrelated and necessary skills – but must select one to feature in their corporate identity. DesignMarks needed a single graphic for use in its promotional materials to inform clients of the services beyond our primary definition, which were available and integrated in our work. 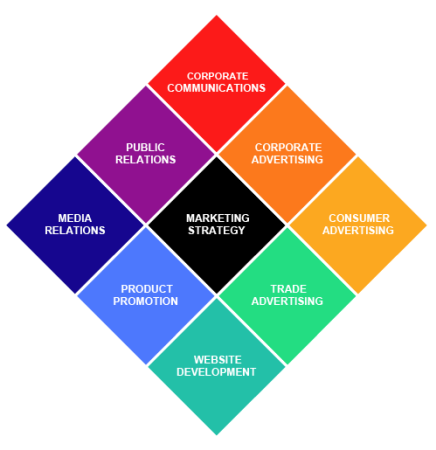 Our graphic solution was this matrix, showing how our marketing, advertising and graphic skillsets were interrelated and centered on our clients’ marketing strategy. Although never used as a corporate logo or servicemark, the graphic was particularly useful in our presentations and promotional materials. Best way to give customers The Big Picture is usually a big picture. We do that. Branding an Association of Just Under Half a Million Individuals with Varying Needs. As organizations (associations, companies, corporations, societies, etc.) grow they tend to become more and more complex and diverse. Products and services grow from within the organization and others are acquired through mergers and acquisitions. However, through all of this the organization still wants to present itself to its employees, its target audiences, and the media as clearly and as comprehensibly as possible. The organization needs to have all of its different parts relate to one another in a way that consolidates its ideas, sections, divisions, companies and brands. In addition, the organization needs to symbolize its mission and attitudes to its employees so that they will all share in the same overall corporate feeling with each other – and then communicate that message to whomever they deal with. The organization also needs to differentiate its mission, its product and its services from any and all competitors in the marketplace. The best way to manifest this goal to so many different audiences and markets simultaneously is to brand the organization through the development of a visual symbol. This symbol must then by applied to all of the organization’s materials: from stationery to signage to vehicles; from marketing to advertising to packaging to exhibits; and to all of the organizations products, services, and publications. This symbol when properly supported by the organization’s motto – and backed by promotional support – becomes the brand identity of that organization. One such organization that required brand renovation was the American Bar Association – the largest voluntary professional association in the world. With more than 400,000 members, the ABA provides law school accreditation, continuing legal education, information about the law, programs to assist lawyers and judges in their work, and innovations to improve the legal system for the public at large. Founded in 1878, the mission of the American Bar Association is to be the national representative of the legal profession, serving the public and the profession by promoting justice, professional excellence and respect for the law. Because it is such a large organization the American Bar Association is constantly developing printed and electronic materials for its various divisions and sections; recruitment and retention; seminars and conferences; books and periodicals; for both members and non-members alike. Most of the divisions, sections, etc. have their own symbols – symbols that represent their own specific needs. And, where this enables small areas of the organization to feel individual, it does nothing to hold the ABA together as an organization. With such a diverse organization producing such an abundance of materials (from liberal to conservative viewpoints; from students to professionals) a symbol that would encompass all of these parameters would need to be simple, straight forward, and easy to read. DesignMarks.biz collaborated with the ABA staff to help conceive and develop an identity symbol that would tie all the various parts of the organization together under one unified brandmark. The American Bar Association logo forms the three basic characters (A B A) together into a ligature format and is distinctive within the organization’s marketplace. DesignMarks’ concern for projecting the image of an organization or a corporation does not end with the development of a brandmark. We are involved in all facets of symbol management, organizational identification programs and visual communications. DesignMarks.biz is expert in both developing total branding programs as well as handling segments of programs that are already established. Establishing Family Branding Increases a Company’s Visibility in the Marketplace. Since the end of World War Two the music entertainment industry has undergone vast changes. Manufacturing and production systems have gone from twelve inch vinyl recordings to compact discs – to downloadable digital files. Music distribution has gone from records to radio, TV and videos – from local to worldwide – from small companies to mega-international corporations – from production studios to garages and basements, and back to production studios. Recording labels and recording companies have been created, bought, sold, abandoned, resurrected and just simply gone out of business. The transition has been staggering. During one of its many transitions the Mercury Record Corporation was producing and/ or distributing thirteen product labels of its own; including Mercury Records, Philips, Smash, Fontana, Intrepid, Limelight, Pulsar, Wayside, Peachtree, and Virtue. Each label had a separate visual brand identity and a distinct target audience. This problem tended to make the parent company (Mercury) seem much smaller effecting mass distribution of the various, seemingly independent, music labels. DesignMarks.biz helped to unify the many product labels under a single corporate umbrella by establishing a company-wide brand identity symbol. We then implemented a coordinated graphics branding system by including the new Mercury brandmark on all corporate, marketing, sales and packaging materials – while still emphasizing the individual recording labels. Each brand label retained its own identity, but was family-branded under the new Mercury brand identification system – thus strengthening The Corporation’s entire marketing image. In summary, the development of the brandmark was initiated to both group Mercury’s many divisions under one coordinated program and to improve the Company’s identification in the very competitive music entertainment field. The brandmark is designed as a spherical emblem both emphasizing the world and the international distribution of Mercury’s various music products. Branding a Corporation and Keeping that Brand Image Fresh Over the Decades. Establishing a brand image for a corporation that can withstand the test of time can be illustrated through the history of Herman Bogot & Co.: now The Bogot Companies. Bogot was established in 1945 as a one-person operation. The Company originally specialized in heating products, such as small boiler installation and maintenance work. By 1963 Herman Bogot & Co. was still a very small enterprise – with just three employees – but the time was right to move forward and begin building “The Company” for the next generation. DesignMarks.biz was called in to develop a “logo” for this small, but emerging company. Over time the servicemark (logo) turned into a brandmark – and is still in use today. With its new image in place the small company began to grow, flourish, expand and enter into new markets and to brand the entire operation. The Company took on projects not only locally, but throughout the United States: from the Carolina’s to Seattle. The greatest exposure that can be developed for a smaller company within its marketplace is generally in the form of exciting marketing visuals: beginning with promotional materials used for direct mail – and then moving into advertising: both printed and electronic. As The Company grew so did our responsibilities: from purely graphic services we began directing materials to their niche audiences, and developing their annual marketing and branding programs. Included in these plans was direct mail, print advertising, sales presentations, trades show exhibits, vehicle branding, web site development, etc. Over the years DesignMarks.biz has worked with The Bogot Companies (which now consist of six very specialized, but product-interrelated companies) to integrate the marketing and the graphics of each of these companies in support of the basic mission of the larger organization. We developed The Bogot Companies’ trademark in the early 1960’s when it was a single entity. Over the years the Corporation has grown, prospered and expanded – and the recognizable mark has been applied to all six of its divisions. By branding each of The Bogot Companies’ individual firm’s they reinforce the marketing and advertising programs of the others – and thereby strengthening the entire organization. There are several basic parameters in the development of a branding system for a corporation. Two such parameters deal with stages of development. One, when a branding development begins one must look at the make up of the corporation and project where the corporation is headed: five years, twenty years, fifty years down the road. Obviously, one starts with the corporation’s current business plans. The second is dealing with the company over the years as the direction of the corporation can (and will) change, depending on the product lines and services of the corporation; management goals; merges and acquisitions; socioeconomic changes – to mention a few. Therefore, the branding of the corporation must adjust to all these changes – and any projected changes. There are several ways this can be accomplished – such as maintaining and adjusting corporate brand standards, revising same, and beginning from scratch. We see examples of this all around us today: Coke Cola, AT&T, FedEx/Kinko, etc. Obviously the aim of branding, marketing and advertising is to put companies in front of their target audience – as often as possible – and within budget. Having a good product or service does not guarantee sales and certainly is not a guarantee of success. The Company still must get the word out to people (as often and well targeted as possible) in order to create a sales interest. DesignMarks.biz has been developing marketing, and corporate and identity programs for a wide range of corporations: multinational to local from its beginnings.